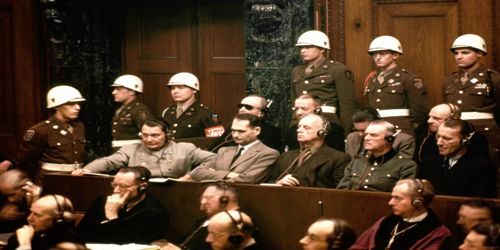 The Nuremberg trials were a series of trials held between 1945 and 1949 in which the Allies prosecuted German military leaders, political officials, industrialists, and financiers for crimes they had committed during world war ii. After the war, the Allies faced the task of cleaning up the aftermath and punishing war criminals. This marked the first time leaders would be criminally charged for their actions during a conflict. 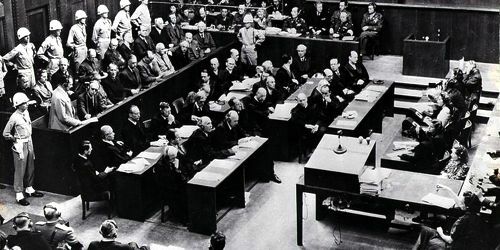 Rules for international military tribunals had to be prepared especially for this trial, and it set a precedent for the many to follow soon after. The city of Nuremberg, Germany was chosen as the location for the trials. Once the site of huge Nazi Party rallies, it would now bring to justice the former leaders of that party. The seat of the international military tribunal was kept in Berlin to appease the Soviets. The Palace of Justice was where the trials were held. It required extensive renovations to repair the building so the trial could be held. Luckily, this building was one of the few to escape major damage in the Allied bombings of Nuremberg during the war. United States Supreme Court Justice Robert Jackson was chosen as the United States’ chief prosecutor in the trial. Roman Rudenko was the chief prosecutor for the Russians. Sir Hartley Shawcross was the British prosecutor. Francis Biddle – Former U.S. Attorney General and American justice on the court. Henri de Vabres Donnedieu – French justice on the court. Sir Geoffrey Lawrence – British justice and president of the court. Ion Timofeevich Nikitchenko – Major general of jurisprudence and Soviet justice on the court. Not all defendants faced all charges. The trial lasted 218 days and included testimony from 360 witnesses. Verdicts were announced on Sept. 30 and Oct. 1, 1946. The executions were all carried out on Oct. 16, 1946 in the old gymnasium of the Nuremberg prison. Twenty two Nazi leaders were tried, including one, Martin Bormann, in absentia after not being found. He was later discovered to have died in 1945. These were all top ranking Nazis, with trials of lower ranked criminals occurring later resulting in thousands of sentences being handed out. Twelve of those tried at Nuremberg were given the sentence of death by hanging, including Martin Bormann. He was Hitler’s heir apparent until days before the war’s end when he fell out of favor. He was sentenced to death by hanging but committed suicide using a cyanide pill three hours before his sentence could be carried out. Sentenced to death by hanging, and executed on October 16, 1946. In 1953 a German appeals court found him not guilty of breaking international law but… it was a little late. Chief of Reich Main Security Office whose departments included the Gestapo and SS. Sentenced to death by hanging, and executed on October 16, 1946 despite request to be shot as a soldier. Three of the remaining ten defendants were acquitted of all charges: Hans Fritzsche, Hjalmar Schacht, and Franz von Papen. Albert Speer, Baldur von Schirach, Konstantin von Neurath, and Karl Dönitz all were given between 10 and 20 year prison sentences. Erich Raeder, Rudolf Hess, and Walther Funk were all given life sentences. Erich and Walther were both released early, Rudolf died in prison. 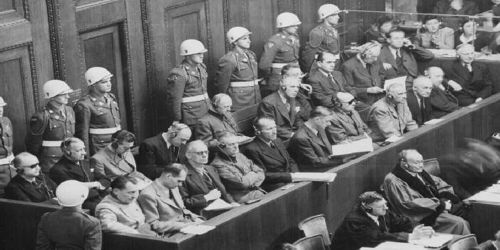 Following the Nuremberg trial came many smaller trials of German and Japanese war criminals. Other war criminals who escaped were brought to justice through the efforts of Nazi hunters and Israel’s Mossad. How to Find the Third Angle of a Triangle?